For a film called “90 Minutes in Heaven,” this adaptation of Don Piper’s 2004 bestselling memoir spends an inordinate amount of time on earthly ground. Only about three minutes of the film are devoted to portraying the divine afterlife, and when they finally arrive, they aren’t worth the wait. A better title would’ve likely been “121 Minutes in Purgatory,” since that’s essentially where audiences will find themselves residing during the entirety of this dreary slog down a familiar road paved with painfully good intentions. What’s especially dispiriting is the botched potential of the film’s premise. Here’s a story about a Baptist minister who dies in a horrific car accident, has a transformative trip to the Pearly Gates and suddenly finds himself brought back to life, reciting the lyrics of a hymn sung by a minister to his bloodied corpse. So taken was Piper with his vision of Heaven that he began to lack the motivation necessary to continue on his path toward recovery. He grew distant from his family and friends, repelling the very acts of kindness that he used to administer on a daily basis to those in need. If that line sounds familiar, it may be because it bears a suspicious resemblance to the title of last year’s highest-grossing evangelical release, “Heaven Is For Real,” a film that is superior on every conceivable level. That picture also recounted the fact-based tale of a near-death experience, yet it actually dealt with the spiritual crises and doubts that arose in its aftermath. 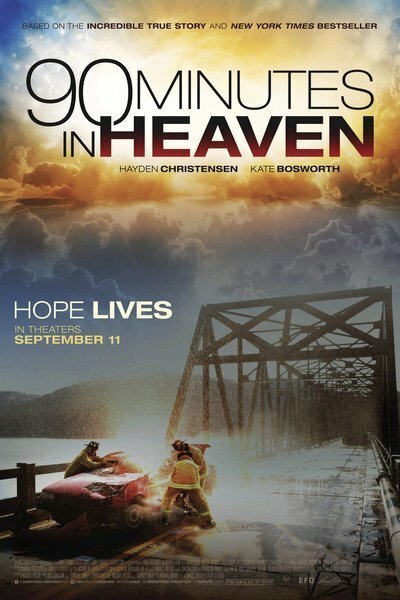 “90 Minutes in Heaven” seems to take for granted the notion that audiences will buy Piper’s story, and thus exerts no effort to make it convincing, let alone interesting. Think of the limitless possibilities that the visual medium of cinema could’ve provided to these filmmakers seeking to depict the awe-inspiring sights Piper encountered after his soul left his body. Aside from widening the aspect ratio, all writer/director Michael Polish—a filmmaker once lauded for audacious fables like “Northfork”—can muster is sun-dappled green screen shots of cheery caucasians dressed in their Sunday best. There are also two black women and an Asian man among the smiling faces, but they’re merely glorified extras on hand for the celestial photo op. One of the primary challenges facing a faith-based film like “90 Minutes in Heaven” is its reliance on the power of prayer as a deus ex machina. What may seem miraculous in real life can often come across as lazy screenwriting on film. There’s one key instance in this picture where prayer leads to a red herring rather than salvation. After praying for a sign that will aid her husband, Eva spots a billboard advertising a personal injury attorney, played by Dwight Yoakam in a thoroughly obnoxious cameo. He meets with her at the hospital cafeteria, where they sit in front of an enormous mural displaying mountains and grassy meadows. With his ten-gallon hat, Yoakam looks like a Hollywood cowboy in front of a matte painting in these scenes, which carry traces of the visual flair that once distinguished Polish’s work. Needless to say, the attorney’s promises prove to be as bogus as the artificial backdrop, and Eva’s hopes are dashed. The film frankly could’ve benefited from a few more complications like this. Faith can’t be strengthened if it’s never tested.